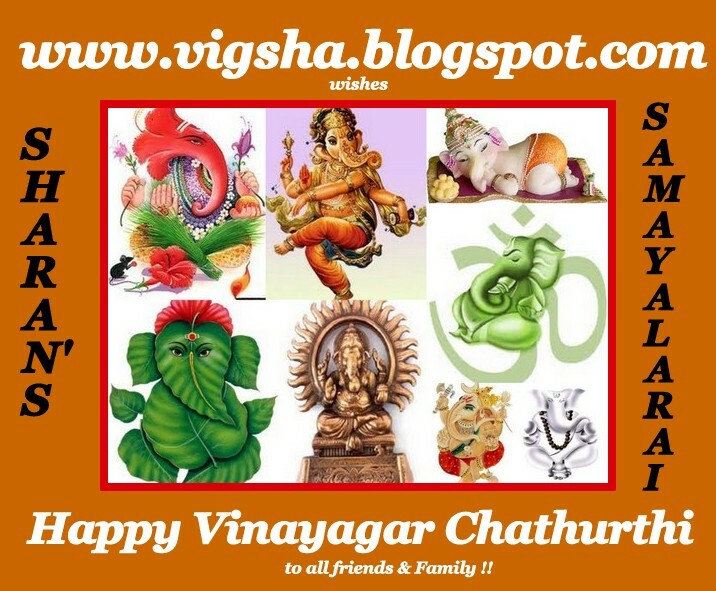 | SHARAN'S SAMAYALARAI |: Vinayagar Chaturthi ~ Festival Event Announcement !! விநாயகர் சதுர்த்தி (Vinayagar Chathurthi) also known as 'GaneshChaturthi' or 'Vinayaka Chavithi' is a spectacular Hindu festival that honors the birth of the beloved elephant-headed god. Lord Vinayaga popularly worshiped for his ability to remove obstacles and bring good fortune. A life-like clay model of Lord Ganesha is made 2-3 months prior to the day of Ganesh Chaturthi. The size of this idol may vary from 3/4th of an inch to over 25 feet. On the day of the festival, it is placed on raised platforms in homes or in elaborately decorated outdoor tents for people to view and pay their homage. The celebration continues for five, seven, or ten days. Some even stretch it to twenty one days, but ten is the most popularly celebrated. Prayers and cultural feasts are offered to Lord Ganesha every day during the festival. On the 11th day, the image is taken through the streets in a procession accompanied with dancing, singing, to be immersed in a river or the sea symbolizing a ritual see-off of the Lord in his journey towards his abode in Kailash while taking away with him the misfortunes of all man. Lord Vinayaga, the son of Shiva and Parvati, is believed to bestow his presence on earth for all his devotees in the duration of this festival. It is the day Lord Shiva declared his son Vinayaga as superior to all the gods. Trying our traditional recipes are real challenge. So thought of organizing this traditional event. 1. Event runs from Sep 15th to Oct15th 2012(EST). So entries within these dates will be acceptable. 2. Post something related to the festival of Vinayaga – It can be about some story on Ganesha that appealed to you. It can be about how you celebrate the Ganesh or Vinayaga Chaturthi. It can be treasured memory of the festival Or it can be a special recipes you prepare for the Elephant God. 3. Usage of logo is Mandatory as it helps to spread the word. 5). No archived entries please. 6). After posting your recipe just submit your entry to the linkies (you will find at the bottom of this post) and leave a comment below. 7). In case you have any problem linking, then send a mail to Sharanssamayalarai@gmail.com with your name, recipe name and recipe url with the subject line as "Vinayagar Chathurthi - Festival Event"
8). Non-bloggers are most welcome to participate. Just send me the recipe with the below details to the above mentioned email. Happy Vinayagar Chathurthi :) Looking forward for all your lip-smacking traditional entries !! just now added Ruland Date Aluwa. Please check dear. Happy hosting. THanks Jillu.. I shall check and update it..